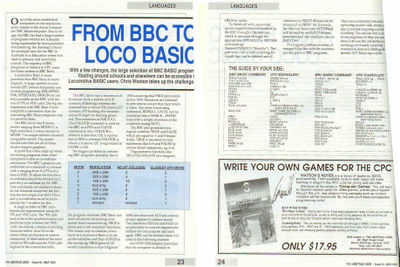 Difference between revisions of "BBC Basic"
A version of BASIC originally developed for the Acorn BBC computers by R.T.Russell. BBC Basic has been ported to many Z80 platforms among them the Amstrad CPC. A Zilog Z80-version of BBC BASIC was later used on the Tiki 100 desktop computer, Cambridge Z88 portable and the Amstrad NC100 Notepad and Amstrad NC200 Notebook computers. It was also implemented on the PC for DOS as BBCBASIC (86) (which aimed for maximum compatibility with the BBC Micro) and BBasic (which concentrated on the BASIC language itself, with its own enhancements based on BASIC II). In January 2002 it was also ported to the ZX Spectrum. BBC BASIC has been ported to many other platforms. This page was last modified on 13 January 2019, at 12:56.